Yay for 25 minute, 6 ingredient, one pan dinners!! 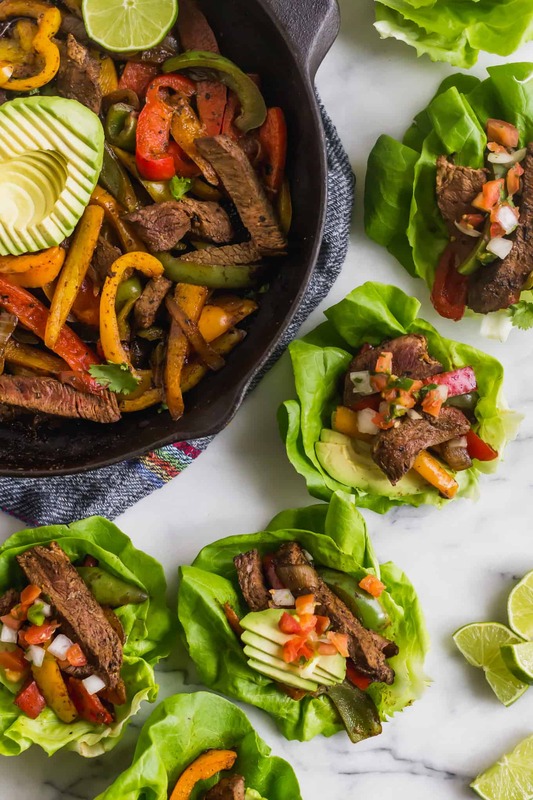 These Steak Fajita Lettuce Wraps make you feel like you’re at your favorite Mexican restaurant! 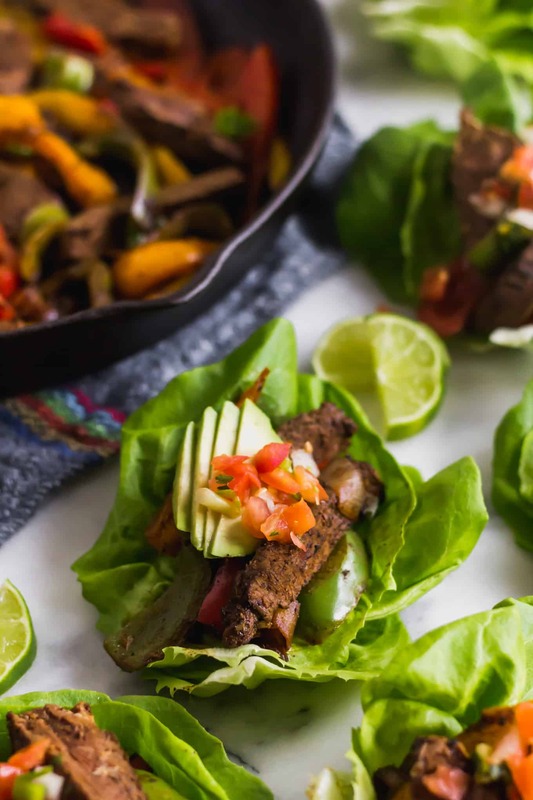 We nixed the tortilla for lettuce wraps to keep them low carb and gluten free, they’re packed with protein, and are paleo & Whole30 approved! 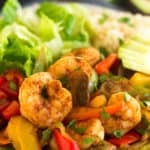 Great for an easy weeknight meal or meal prep! One pan dinners make my world go round. I feel like sometimes my life consists of washing dishes. Make recipes for the blog, wash dishes. Do meal prep for people, wash dishes. Meal prep for Michael and I, wash dishes. Make meals for my/our breakfast/lunch/dinner, wash dishes. It’s like wash dishes, do work on the computer, and workout. Okay maybe I’m exaggerating, but some days I feel like they never end. Luckily my fiancé is a nice guy and usually does the dishes after dinner. If I make the dinner, he washes. And if he makes the dinner (which hasn’t happened in a long time), I wash. But being the nice person that I am, I try to limit the dishes when I cook dinner so he doesn’t have to wash that many. I’m sure he will say otherwise, but I really do try! So one pan dinners make us pretty happy campers. Less dishes to do means more time for funtivities. 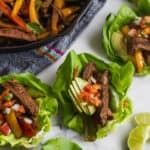 Besides hitting the ‘one pan yay not a lot of dishes factor’, these steak fajita lettuce wraps are so simple to make and only take 25 minutes! First you get a cast iron pan super hot (it gives the steak a nice sear), cook the steak in there, and then remove it to let it rest. While the steak rests, you cook up the onions and peppers. Once those are done, you add back in the steak, mix to combine, and then it steak fajita taco time! Since I am doing the Whole30 right now, I made them into lettuce wraps! They make a great alternative for tortillas and keep the meal low carb, gluten free, and Whole30 approved. I like to use butter lettuce as it is super light and makes the perfect lettuce cups. To make it even more simple, I found a Whole30 complaint pico de gallo to top them with. I also added avocado, cilantro, and lime juice. Hot sauce, coconut yogurt (or dairy if you tolerate it and not doing the Whole30), and salsa would all be great options too! 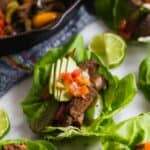 These steak fajita lettuce wraps make a great easy and healthy weeknight meal or meal prep option. If you are making them for meal prep, just store the lettuce cups and toppings on the side until you are ready to assemble! Yay for 25 minute, 6 ingredient, one pan dinners!! 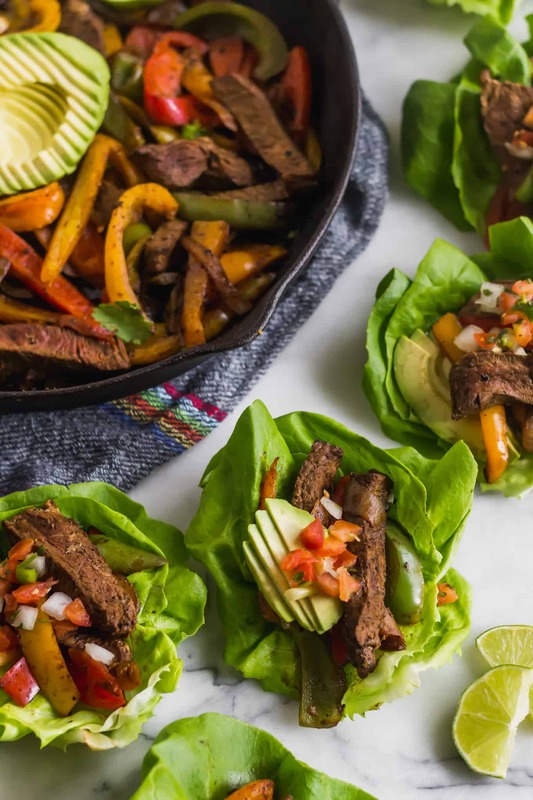 These Steak Fajita Lettuce Wraps make you feel like you're at your favorite Mexican restaurant! 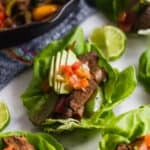 We nixed the tortilla for lettuce wraps to keep them low carb and gluten free, they're packed with protein, and are paleo & Whole30 approved! 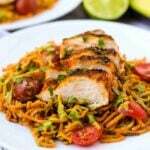 Great for an easy weeknight meal or meal prep! Season steak liberally with salt and pepper. Place a well seasoned large cast iron pan over medium heat and let it get hot, about 1-2 minutes. Add steak and cook for 2-4 minutes per side (length will depend on how thick your steak is) without moving. Flip and cook for another 2-3 minutes until it reaches your preferred doneness. 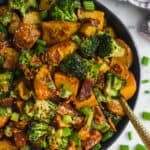 You will be adding it back to the pan so it doesn't have to be cooked all the way to your liking. Remove from pan and let rest. Add onion and sauté for 5-6 minutes, stirring occasionally, until softened and slightly browned. Add peppers and taco seasoning, stir to incorporate, and sauté for another 5 minutes, stirring occasionally. 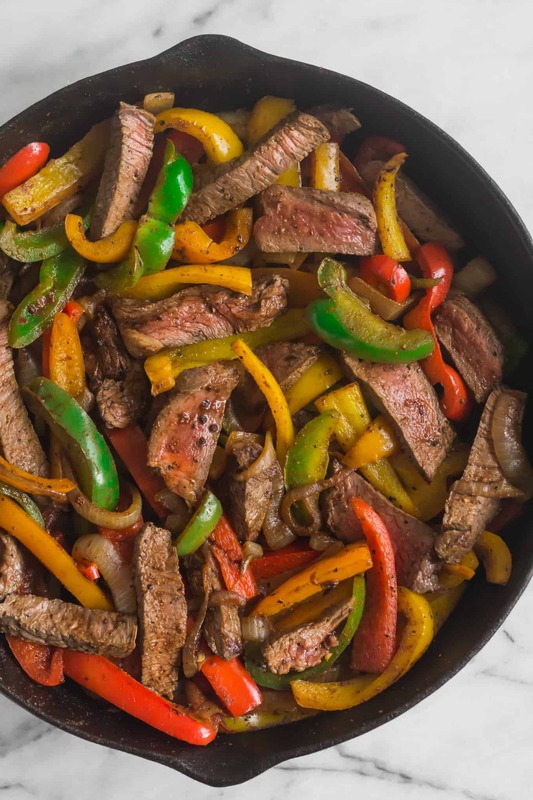 While the peppers cook, slice the steak into thin pieces. Turn the heat off, add in cut steak and 2 tablespoons lime juice. Stir to incorporate and cook for another 1-2 minutes until warmed through and well incorporated. Serve over top lettuce wraps and top with toppings of choice. OMG! I just found your website and you are amazing! 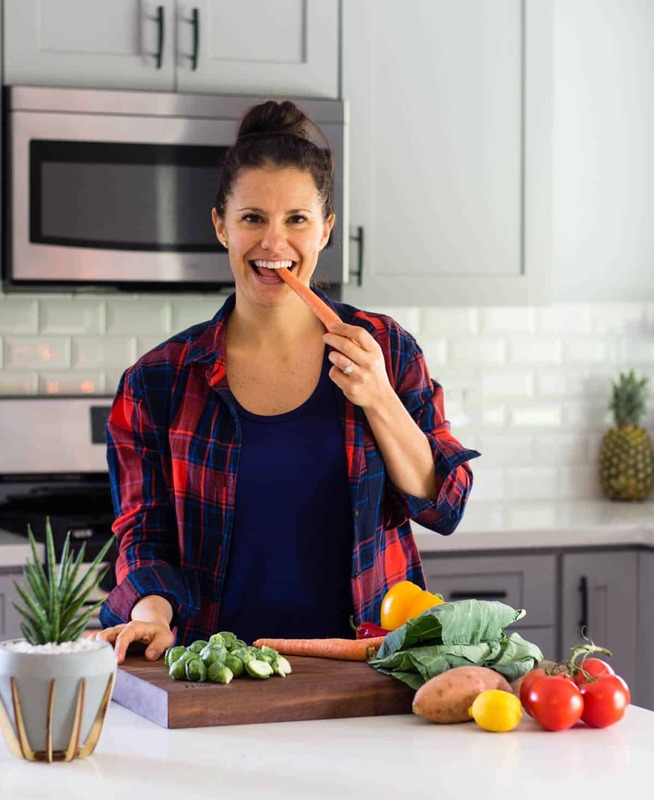 Your recipes are very creative and comprised of exactly what my family wants and needs. 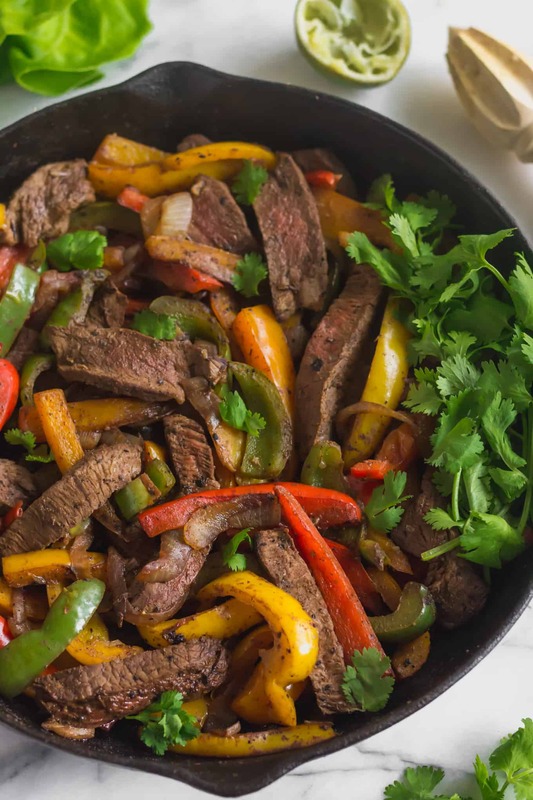 My husband will love this fajita recipe. And my daughter is pescatarian and coming over for dinner tonight. I am going to prepare her one of your salmon bowls to take home with her. Thank you, so much! Thank you so much Kim, that means a lot to me! I used to be a pescatarian for 5 years so I’m all about the veggies, eggs, and fish dishes. Thanks so much for stopping by!